The average Dutch man measures in at 1.83 m (6 ft 1 inches) and their lengthy female counterparts at a respectable 1.71 m (5 ft 6 inches). The Dutch are people you can look up to, literally. I often found myself cursing my 5 ft 4 inches height as I craned my neck upwards to be able to speak to them. The fun thing here is that the Dutch haven’t always been that tall, but in only a century’s time, they went from being amongst the shortest nations to being the tallest people on the planet! If I can figure out their secret, I’ll let you know. If you walk around Amsterdam, you soon start to notice that nobody draws their curtains. Nobody. Curious about the neighbors new sofa bed? Want to know what most Dutch folks are watching on the TV? Want to know what they eat for dinner? You can find the answers to all your questions with a stroll along the canals! Of course I’m kidding, because (ironically to some) it’s considered impolite to stare inside. Which I cannot avoid doing. Ever. The population of Amsterdam is around 825.000, and with an estimated 881.000 bikes in Amsterdam, it’s absolutely correct to say there are more bikes in the city than residents. About 70% of citizens are believed to use their bike daily, meaning that if you don’t own a bike, you are practically a weirdo. The Netherlands is famous for its dedication to cycling, and the vast amount of bikes lining its streets is kind of unbelievable at first. Venice is definitely the most well-known canalled city in the world, but not because of quantity. 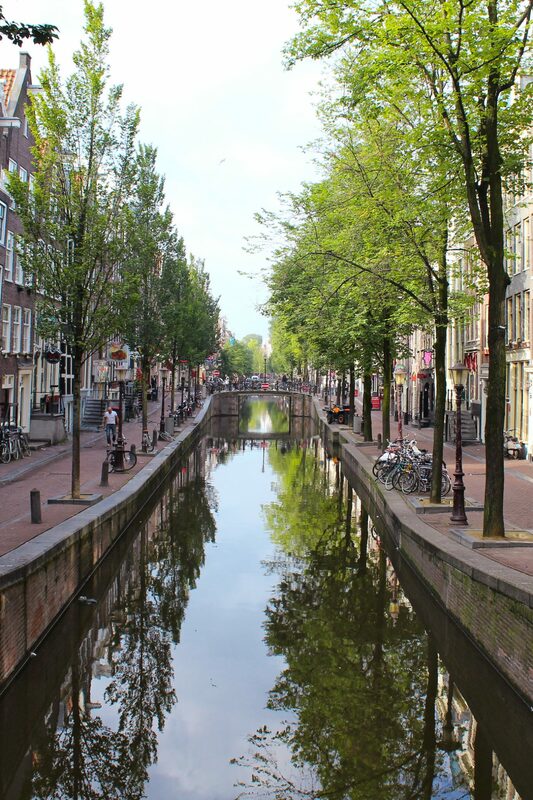 Often called the “Venice of the North,” Amsterdam boasts over 165 canals, about 15 more than Venice. 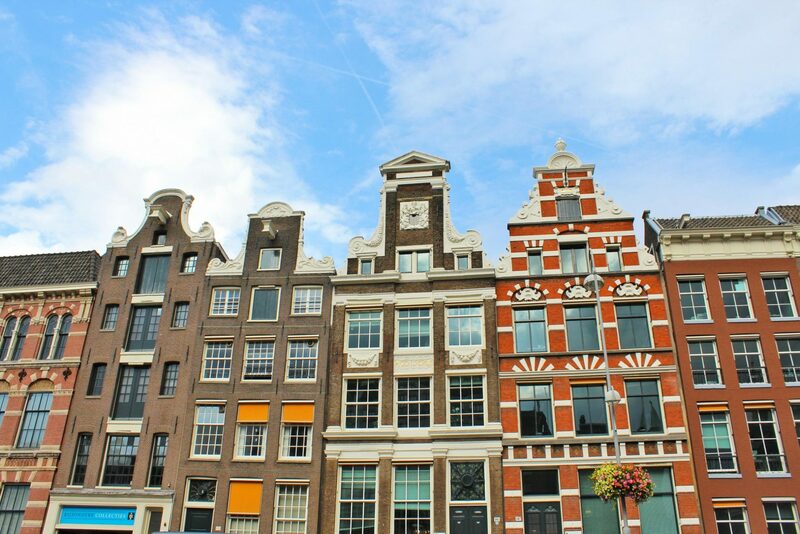 In Amsterdam there are 7 famous leaning houses in a row called the Dancing Houses – but once you see one, you begin to see quite a few more. Building are that wonky because the foundations are build on trees, which are now sinking. What is even more funny is the fact that, instead of rebuilding the houses, they just straighten the facades, so you might see leaning buildings with perfectly straight doors and window frames. I personally find them beautiful! Licensed coffee shops are allowed to sell soft drugs, and people are allowed to grow cannabis at home for personal use. But you know what’s really funny about it? Since this law was put in place, the amount of people in Amsterdam addicted to drugs has gone from 10,000 to 200, and the amount of locals who smoke weed on a regular basis went down to 5%! 7 – SAY NO TO SMOKING…CIGARETTES! Smoking tobacco in cafés and restaurants was banned in Amsterdam in 2008, and shops are mixing a kind of herbal tea as a substitute. Essentially, you can light up a joint, but if they catch you with tobacco…look out! Amsterdam, and even half of the Netherlands, lies below sea level. Apparently, without the various technologies that have been studied and implemented over the last five hundred years, the city would be submerged under about six feet of water. Floating in the canals of Amsterdam are over 2,500 houseboats which have become somewhat of an icon of the city. Many of them have been converted into hotels or b&b, so they’re perfect for those who want to experience what it’s like to live on a houseboat. 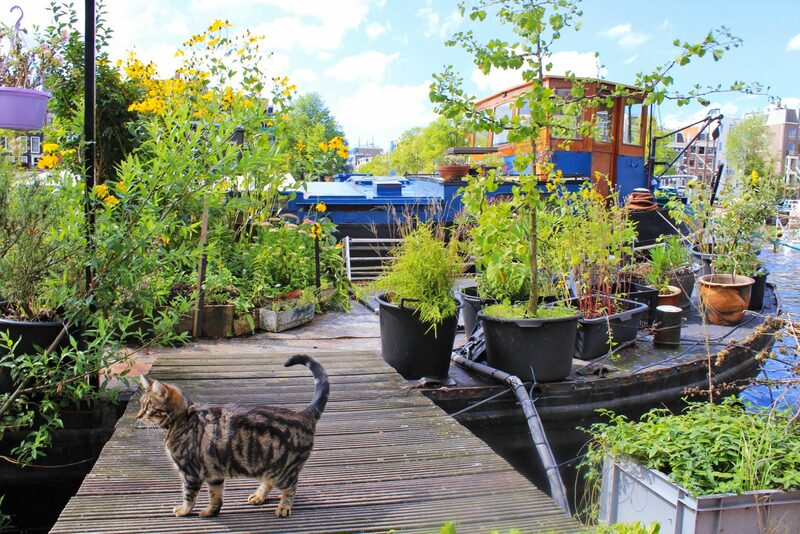 For those who love cats, check out the unique “De Poezenboot.”, also known as the “Cat Boat”. Surprised? For a city with the reputation of “anything goes” Amsterdam is actually among the safest cities in the world, and in a personal safety survey it ranked 13th. 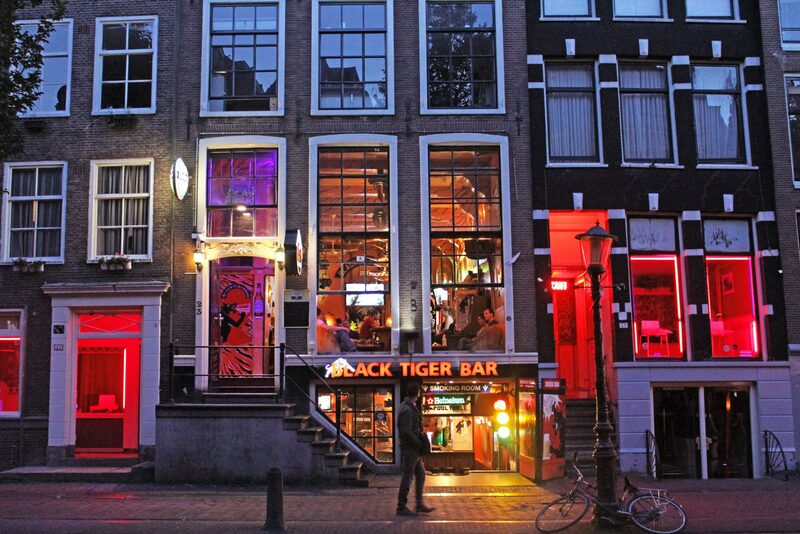 Amsterdam has also a far lower crime rate than most other prevalent European urban communities. After all, the more that is permitted, the less there is to get in trouble for. 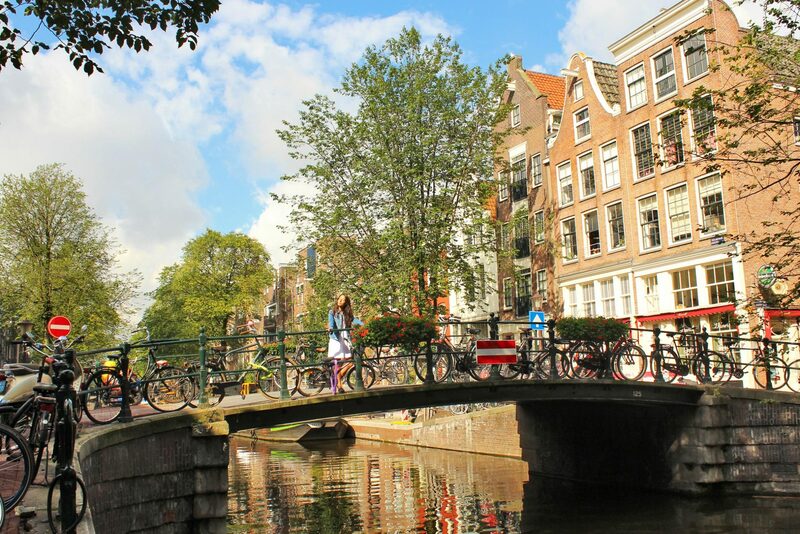 Did you know these fun facts about Amsterdam? Let me know!